The key element of any kitchen is their appliances. They make the cooking experience smooth and efficient. Kitchen appliances play necessary and important role in any kitchen design. The kitchen aesthetics can be spoiled by the use of ordinary kitchen appliances. The basic reason is the design & finish of the appliances are not in harmony with the kitchen cabinets. This can be resolved by using modular kitchen appliances. A modular kitchen allows the selection of appliances that combine with the kitchen interiors hence, improving its aesthetics. They are also high in terms of functionality. Wide ranges of appliances are available which can transform your kitchen into an engaging work zone. Listed below are the various advantages of modular kitchen appliances. Modular kitchen appliances are integrated and built-in with the kitchen cabinets. This feature saves beneficial space of the kitchen. The kitchen interiors look tidy and classic because of them. The wiring and pipelines used for the appliances are usually hidden which gives a decent and clean look to the kitchen. Nowadays, everyone is health conscious. The first step one must know in order to stay healthy is about the right diet & food habits and also reduce the amount of oil intake. Appliances purchased should be easy to clean, grease-free and able to use it efficiently. To help human reduce their workload, machines are built,but there are some of the appliances that do not serve the purpose quite the way we hope them to do. To ensure that the environment is comfortable for you to work, one must have the right and appropriate kitchen appliances. If it cannot operate properly, there is no point of buying or purchasing any appliance. Now we know what aspects are to be considered when choosing kitchen appliances, let us list down what kitchen appliances one should have in modular kitchen. 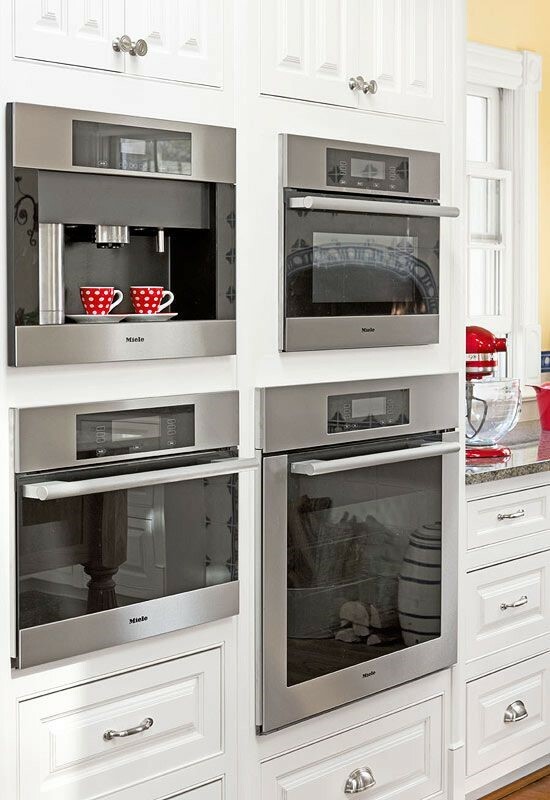 A modular chimney is an essential item to the list of kitchen appliances. They work as an exhaust placed just above the burner or stove.It helps in removing the hot air and smoke from your kitchen and provides proper ventilation. It guarantees that the oily and stickiness from the smoke and fumes do not stick to the walls or other places in the kitchen and completely absorbs the oil, hence protecting the wall and other places from stickiness. 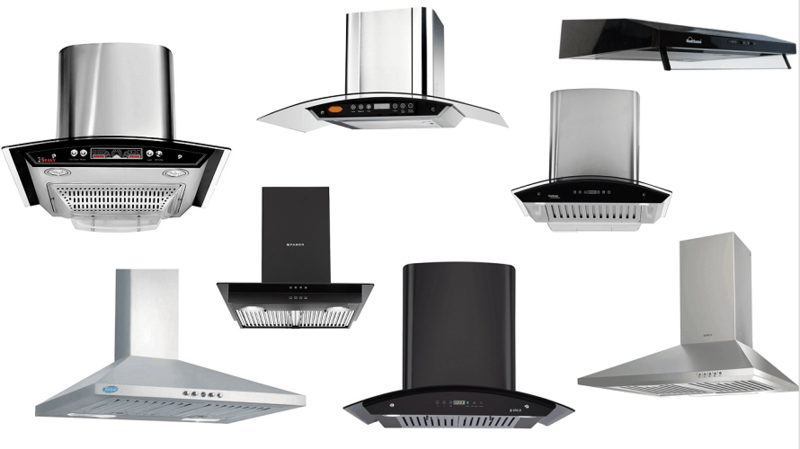 Chimneys come in various range, are operated electronically, have lighting fixtures, self-cleansing technologies and wide range of design options as per choice and needs of the user. Nowadays, chimney and induction stoves are available in combo offers. The new range of burners and stoves have spark powered knobs that do not require to light the burner with matchsticks or lighter. These are easy to clean,maintain and safe to use. Modular kitchen is not complete without a microwave oven. It is a very useful appliance with a wide range of utilities like heating, baking, toasting, grilling, etc. 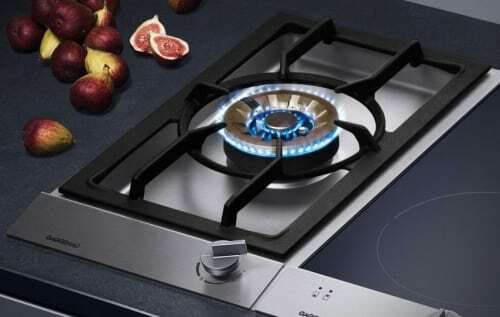 They have smooth design options to combine these utilities near the hob for an easy and efficient cooking experience. It is very easy to use (even children can use it under parents’ guidance),helps in saving a lot of time, easy to heat food (with the use of utensils perfect for microwave), easy to wipe &clean, less human interference required and hold on nutrients and vitamins in the food. There are various different other utilities like making potato chips, froth milk for latte, toast nuts, dry herbs, make cakes, pizzas, popcorn without using bags and many more. 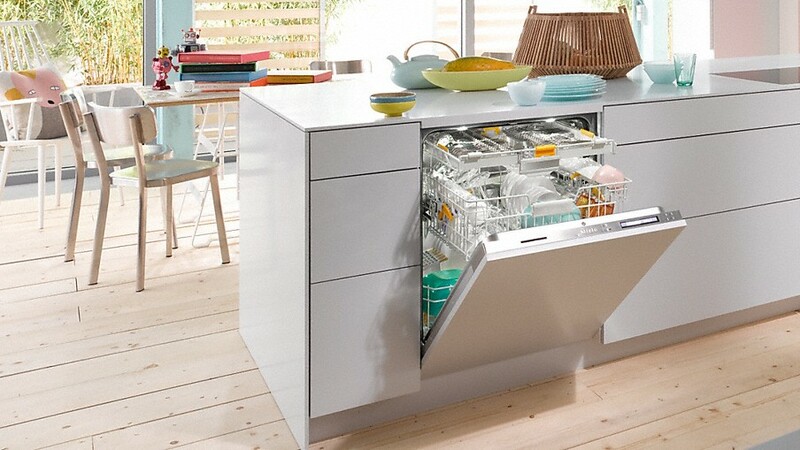 Built-in Dishwashers are provided with innovative technology and greater performance. These are highly efficient and designed with features of energy saving but can be little more expensive than expected. Edged stainless steel interiors, flexible racks, and various spray units including numerous wash cycles are provided with the finest dishwashers. They also support dry options and eco-friendly wash.
To get more efficient design and systematic storage for cooling,it is advisable to get an inbuilt fridge along with the modular kitchen. It has both options of cold and hot water dispensers attached to it; sometimes the pantry shelves and racks are designed in such a way that it can function with the fridge unit. They are placed near the dishwashers so that wastewater from these may be used in dish- washing hence providing efficient and eco-friendly design option. 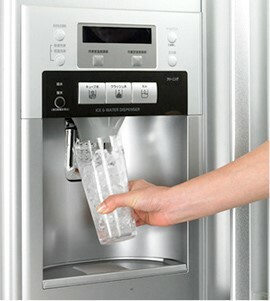 In addition, they are generally combined with water dispensers to make a combined unit, hence reducing the space demand in kitchen. Nowadays, electronic blender is preferred over traditional techniques of blending spices and other ingredients by most of the home makers. A blender is very valuable appliance without which you are destined to face many troubles during making of smoothies, cream soups & gravy and anything that needs to be blended. Its container is made of straped glass or stainless steel jar with a compact-fitting lid. To mix the content inside, it is firmly fixed on top of a small motor that spins a rotating blade inside the jar and runs at different speeds. This is a very important kitchen appliance as it significantly reduce the oil content in your food and is user-friendly. The air fryer comes with an exclusive combination of high-speed air circulation, with top grill. The combined mechanism makes the hot air circulate very quickly over the ingredients in the basket. This heats up the ingredients in the basket from all sides at a time, making it a healthy, fast and easy method to prepare tasty food reducing oil content. It can prepare various food items such as potato fingers, chicken nuggets and many more deliciously crispy on the outside, without actually drying on the inside and most particularly, with the minimum use of oil. Finally one on this list is Barbeque Grill which is becoming famous and is mostly custom-made with island type modular kitchen or even in modular kitchen where there is provision of breakfast counter. This amazing new appliance make sure that it absorb the minimum oil while retaining the taste of your food. Since it can be used dry or with just a bit of cooking spray, the food doesn’t come out with grease. Also Read: Tips to Design Your Kitchen Work Surfaces or Centers! Above listed were the modular kitchen appliances which plays an integral part of modular kitchen.While buying Modular kitchen,list down the appliances you need in the kitchen for smooth and proper functioning as well as also that suit your budget. Just don’t see that it looks good in showroom will make it look good in your kitchen.Be wise and smart while choosing them. 10 Smart Kitchen Gadgets to transform your Kitchen! Previous PostPrevious Basic Guide & Types of Plaster that can be Use for Your Dream Home! Next PostNext Adjust your Kitchen Cabinet Heights as per your convenient!